Portstewart Golf Club, Northern Ireland, April, 2012. Six friends and I returned this afternoon from eight days and fourteen rounds of golf in Northern Ireland and Ireland, and earlier this month I spent a similar week, by myself, in northeastern Scotland. I’ll have more to say both trips as soon as I’ve reintroduced myself to my wife and gotten caught up with the pile of stuff on my desk. In the meantime, I’ve been thinking about an earlier Ireland trip, back in 2006, and something that happened on the evening I arrived in Shannon (from Dubai!). The baggage carousel was still revolving, but several minutes had passed since the last suitcase tumbled onto the conveyor. A young woman in a green Aer Lingus uniform walked over to me. “Is your bag missing?” she asked, her eyes radiating concern. I looked around. The other passengers had departed. The truth sank in. “My g-golf clubs,” I said. It’s the traveling golfer’s nightmare. I had come to Ireland to spend a week playing southwestern seaside courses, and now, I thought with horror, I was going to have to play Ballybunion with rented equipment—with battered, mismatched irons and woods contaminated by the bad-swing juju of who-knew-how-many anonymous choppers, shankers, and honeymooning beginners. How could I face Waterville without my very own Banzai-shafted 10.5-degree jumbo driver, not to mention my humiliatingly extensive but indispensable collection of hybrids? I followed the Aer Lingus woman into her office, where she helped me file a claim. Fifteen minutes later, I was sitting numbly in a taxi, on my way to the tiny resort town of Lahinch (which is famous in Ireland not only for golf but also for surfing, of all things). Three Golf Digest colleagues would be joining me there the following afternoon, along with two rental cars. I was trying hard to appreciate the lush landscape on either side of the road, but I couldn’t stop thinking about my clubs. Why couldn’t the airline have lost Jodie Foster’s daughter instead? Then the driver’s cell phone rang. “Right,” the driver said, after a brief conversation. “You’ll have your golf clubs by noon tomorrow. I’ll probably deliver them myself.” The young woman in the lost-baggage office, it turned out, had located my bag, in London, and had then taken the time to locate me, by telephoning the taxi dispatcher and asking if a Mr. Owen had been sent to Lahinch. I leaned back against the seat and smiled, finally able to relax. The next morning, I borrowed a set of clubs from Robert McCavery, just the fourth head professional in Lahinch’s 120-year history—he succeeded his father, Bill, who got the job in 1927—and played eighteen holes with two middle-aged women from Switzerland, who were traveling without their husbands. My golf bag arrived just as we finished. A week later, I was back at Shannon Airport, killing time before my flight home. And sitting at a table on the other side of the coffee shop, I suddenly noticed, was the young woman from the lost-baggage office—the woman who, a week before, had tracked me down in my taxi. I rushed over, and thanked her for her kindness. She looked startled for a moment, then smiled. “Mr. Owen,” she said. We have a responsibility, as golfers and as Americans, not to abuse the hospitality of this gracious, enchanting country. 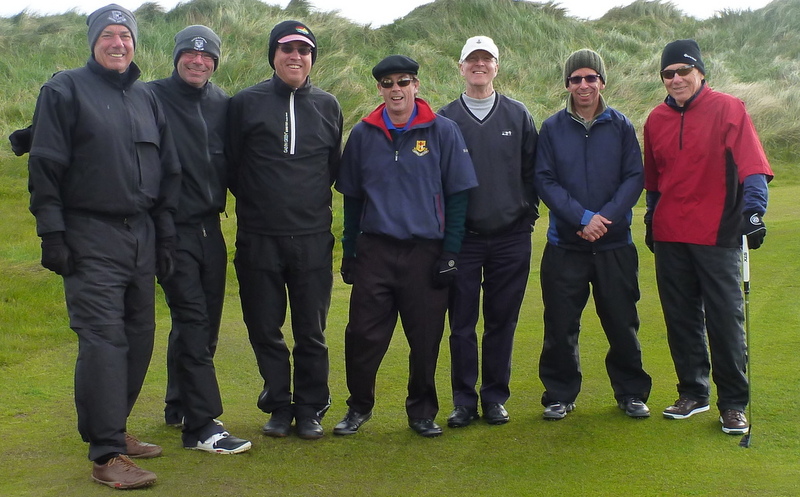 Tony, Tim-o, Dave-o, Tim, David W., Howard, Jack: Enniscrone Golf Club, Ireland, April, 2012. This entry was posted in Buddies Trips, Golf Courses, Ireland, Scotland and tagged Ballybunion, Lahinch, Waterville by David Owen. Bookmark the permalink.